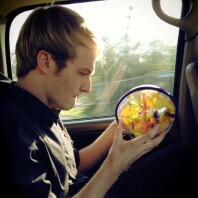 Jesse showing off a turtle at a local pond. Jesse is an associate professor in the School of Biological Sciences at Washington State University. He completed his PhD with James P. Collins at ASU in 2004 and was a post-doc with Richard S. Ostfeld at the Cary Institute of Ecosystem Studies. His research focuses on the evolutionary ecology of infectious disease, especially the many facets of disease transmission. Christian completed his B.S. in ecology and statistics at the University of Tennessee, Knoxville and spent a year there working as a research technician in the Center for Wildlife Health. 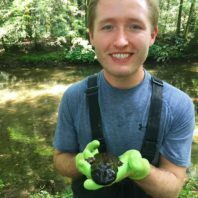 He’s broadly interested in amphibian conservation, and his master’s research will explore ways in which human activity may be driving ranaviruses to become more harmful to the hosts they infect. When he’s not contemplating salamander extinctions, he’s likely on a walk somewhere with his beloved pug, Darwin. Erin graduated from the University of Vermont in 2016 with a B.Sc. in Biology. As an undergraduate student, Erin worked in an ecological parasitology lab where she became fascinated with infectious disease. Erin continued on at UVM as a master’s student studying the life history and modes of transmission of a gregarine parasite she discovered, Monocystis perplexa, in the invasive earthworm colloquially known as the ‘crazy snake worm’ (Amynthas agrests). Erin has joined the Brunner lab as PhD student studying heterogeneity in susceptibility of wood frogs (Lithobates sylvaticus) to Ranavirus. 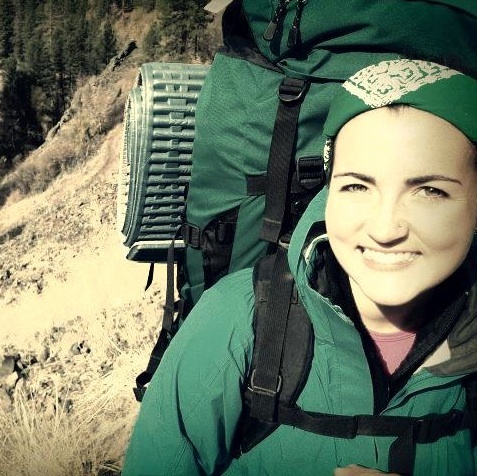 In her free time, Erin enjoys bird-watching, hiking, and camping. Emily graduated from Villanova University in 2018 with a B.S. in Biology. 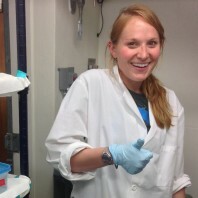 While at Villanova, Emily worked in a lab that studied the ecology of hybridizing chickadees. For her undergraduate thesis, Emily genotyped parents and offspring to determine the effect of extra-pair copulations on analyses of hatching success in the chickadee hybrid zone. She became interested in tick-borne disease ecology after working in a vector-borne disease lab, where she studied the ecology of tick-borne diseases in southern Maine. Emily has joined the Brunner lab as a PhD student studying the ecology and behavior of black-legged ticks (Ixodes scapularis). Emily likes to unwind by spending time outside, baking, and watching Bob Ross painting tutorials. Johnna completed her B.S. in Biology at Northern Arizona University, then worked four seasons as a Wildlife Technician with Utah Division of Wildlife Resources monitoring bird, bat, rodent, pika, and fish populations. For her M.S. research project, she is interested in studying the ecology of Rocky Mountain wood ticks (Dermacentor andersoni). Her hobbies include being a bird-nerd, adventuring outdoors, and silversmithing for her small business Unforgotten Wild Jewelry. Christina graduated from WSU in 2016 with her B.S. in Zoology. Her primary interest is in animal medicine but she has recently begun to explore in the field of epidemiology and entomology. During her masters program, and the summer before, Christina traveled to New York to study the blacklegged tick. She is interested in discovering the effects of harsh environments on the ticks at multiple life stages and in tracking their questing behavior. In order to unwind, Christina enjoys backpacking in the summer and snowboarding in the winter. Mitch graduated from Lycoming College in Pennsylvania in 2010 and then proceeded to work on a number of disease-related projects as several institutions, including the Cary Institute, where he first met Jesse. His research at WSU focused on how scavenging invertebrates shape the transmission of ranavirus infection in salamander larvae. (They do, a lot!) He graduated with a M.S. in 2017 and joined Dr. Louise Rollins-Smith’s lab as a technician. Sarah showing her excitement about her experiment! Sarah completed her B.S. in Biology at University of Missouri-Kansas City and earned her M.S. at WSU before returning to St. Louis to teach science. Her research focused on the evolution of parasite virulence with coinfecting strains of ranavirus. She is from St. Louis, MO, and is an avid fanatic of the Denver Broncos, St. Louis Cardinals, and Halloween. 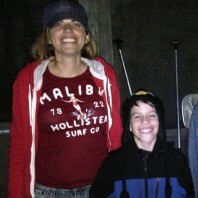 Alex is from Sacramento, California. He got his bachelor’s degree in the History of Science from California State University, Sacramento and then joined the lab in 2013. He started working on the biology ticks, but decided that while he is still thrilled about science, he wants to convey that enthusiasm to students as a teacher. Angie defended her M.S. thesis in 2013. 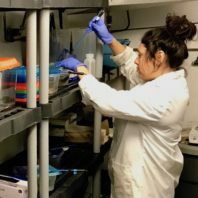 Her paper on the the persistence, and thus potential for water-borne transmission, of ranaviruses in the face of aquatic community members (i.e., microbes and zooplankton) was published in Diseases of Aquatic organisms. She’s currently a lab manager at the University of Idaho. Scott joined the lab in the Fall of 2012 after finishing a M.S. 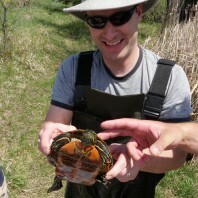 on Box Turtle relocations at Towson University. Unfortunately, much of his research ended up also being about Ranavirus in turtles when he observed a die-off in the populations he was monitoring. He decided to pursue more direct conservation work instead of a PhD. We wish him well! 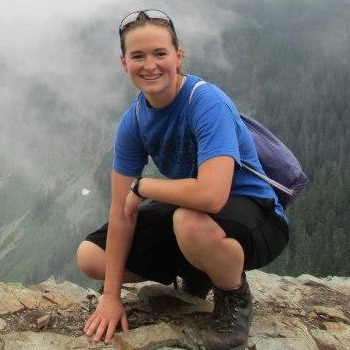 Brooke received her master’s degree in 2011 from SUNY-ESF, when the lab moved to WSU. Her research (Reeve et al. 2013 in EcoHealth) was on the effects of three natural challenges on stress and susceptibility to disease of wood frog tadpoles. She also conducted research on the susceptibility of Kihansi Spray toads to Bd and endosulfan. After teaching English in China, searching for wood frogs in the Northeast, working for the USDA ARS, and in several diagnostic labs, she is now at a USDA lab in Maryland doing molecular diagnostic method development for plant pathogens. Jenn was our lab manager, shared with the Crespi Lab, and all around research facilitator for several years. She brought a great deal of experience to the lab, not to mention a lot of fun!. Unfortunately for us, she moved on to greener pastures of the School for Global Animal Health. Brendalis graduated from Rochester Institute of Technology with a B.S. in Biomedical Sciences and is interested in attending graduate school to study infectious diseases. She joined the lab in summer of 2018 as part of the NSF REU program. Brendalis is working on the effects of temperature on the replication of Ranavirus in Fathead Minnow (FHM) cells. Ana Trejo caring for frogs. Ana joined the lab in the spring of 2017 and completed her honors thesis on recrudescing ranavirus infections. She is interested in science outreach and education. 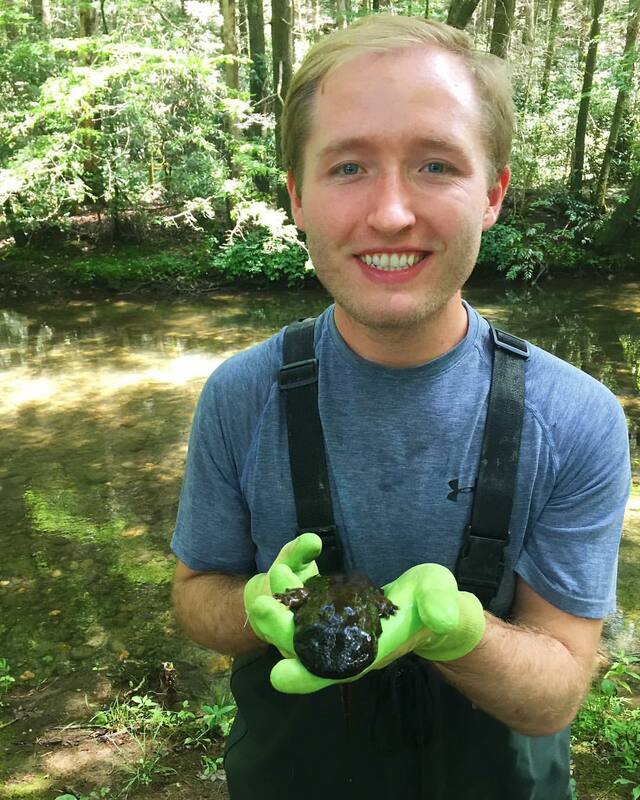 Bailey joined us in the spring of 2017 and helped Mitch with his work, as well as doing her own experiment on the functional responses of invertebrate scavengers to increasing density of salamander carcass “prey”. Go ecology! Abbi joined the lab in 2016 and quickly made herself terribly helpful in lots of ways. She graduated in 2017 and went off on a Fullbright-supported adventure to Austria. Jeremy is a Senior on the pre-med track, but has been lured into the Brunner lab by the siren song of infectious disease ecology. And maybe because he says yes to everything… He has helped out in myriad projects, particularly with Sarah’s experiments, and is now working on an independent project looking at disease in the live animal trade. Kai graduated worked in the laboratory for several years until he graduated in 2015. He is very interested in herpetology, behavior, and diseases of herpetofauna. 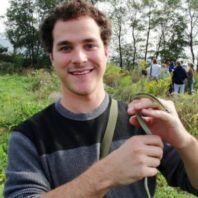 He spent two summers helping survey the reptile and amphibian diversity at southern Tibet, and helped describe a new viper species they discovered. 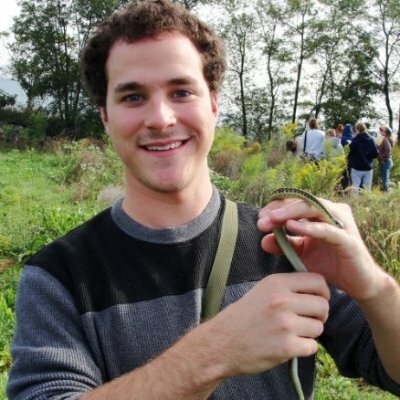 He worked with me on a system to quantitatively study the longer-term behavioral responses of amphibian larvae to predators. He joined Cameron Siler’s lab at the University of Oklahoma in 2015 and recently received the NSF Graduate Research Fellowship! Michelle graduated in 2015, but in her time in the lab she helped with all sorts of projects. I am forever indebted to her for doing the bulk of the work entering ranavirus-related papers on the ranavirus.org website, and for searching publications for dose-response data. Thank you! Anjulie joined the lab in 2014 as part of the NSF-funded Undergraduate Math-Biology program. She led an experiment focused on evaluating three non-lethal methods of detecting ranavirus infections using bullfrog tadpoles. Nicole worked in our lab with Sarah for a bit over a year, putting in lots of hard work over strange hours. Thanks! Heather graduated with general biology major in 2014 and is planning to attend graduate school with a focus on genetics or disease. She helped with numerous projects in her several years in the lab. Thank you! Betsy worked in the lab 2012-2013 and graduated with a zoology major in 2014. 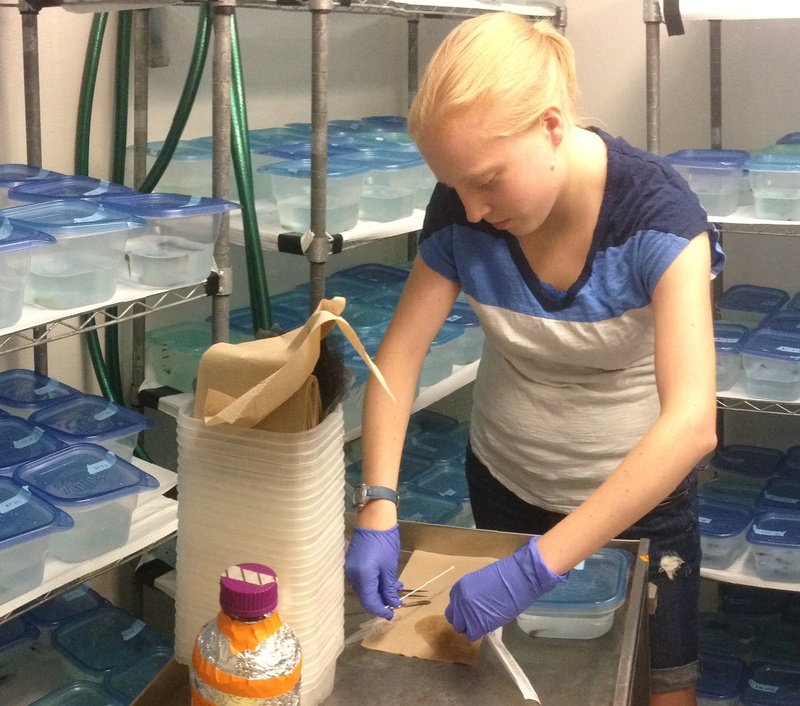 Jenna started volunteering in the lab her second semester at WSU and then assisted with a large mesocosm experiment. She also conducted an independent research project on the degradation of Ranavirus during freeze-thaw cycles. After graduating, she hopes to work in the field of conservation biology and conduct research that promotes environmental wellbeing. 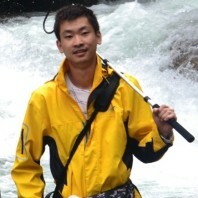 John, or JJ, worked in the lab in 2011-12, helping samples and everything else that we needed help with. He is starting med school in Oregon in 2016! Well done! 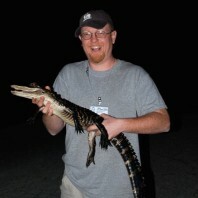 Rob worked in the lab in 2011-12 and helped with a ton of sample processing. Thanks! 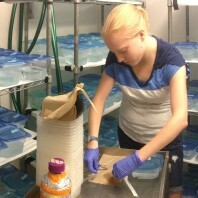 Megan worked on a large mesocosm experiment in 2011 as part of the NSF-funded Undergraduate Math-Biology program. 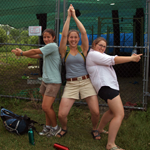 Deanna, Lynne, and Alex were an amazing trio of undergraduates from SUNY-ESF. 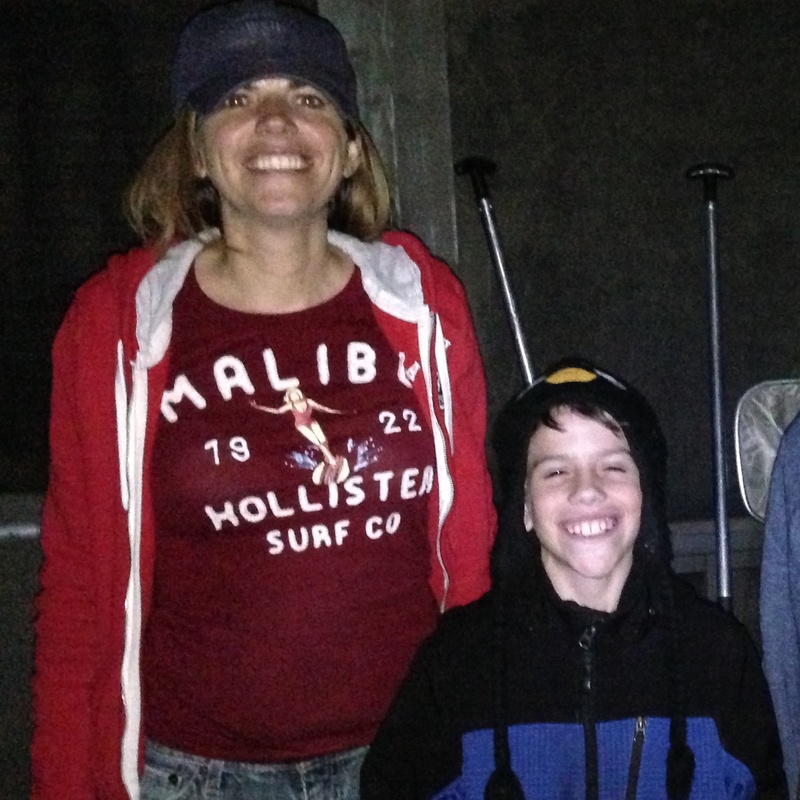 They were instrumental in the large, mesocosm epidemic experiments we ran in 2010. Lynne received her M.S. at Texas Tech and is now working on a PhD at Oklahoma State University; Deanna has been a research technician for the USFWS, Michigan State University, a project working on Cheetahs in Kenya; and Alex is working for IDEXX and completing a masters in public health.